This fun model has Santa sitting at the foot of a tall Candle checking off the good and bad children on his long list. Our Santa sitting with Candle and List shows Father Christmas taking a well earned break checking his deliveries against a long list of children. His sack is brimming with gifts and he holds a feather quill and fabric scroll. The 5.9ft Candle behind him is electric and lights up, this really adds to any grotto or Christmas display. 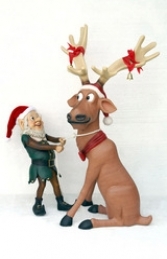 This model can be used to huge effect as a great Christmas decoration and is ideal for all businesses, pubs, restaurants, coffee shops, adventure golf courses, children’s farms, zoos, theme parks etc to decorate and promote Christmas events, activities and parties or this would even look fabulous in your own home or garden for a Christmas display to outdo all the neighbours.